It was difficult for me to find something square in my apartment. I have a kitchen timer and a square alarm clock, but I kept looking for something else. 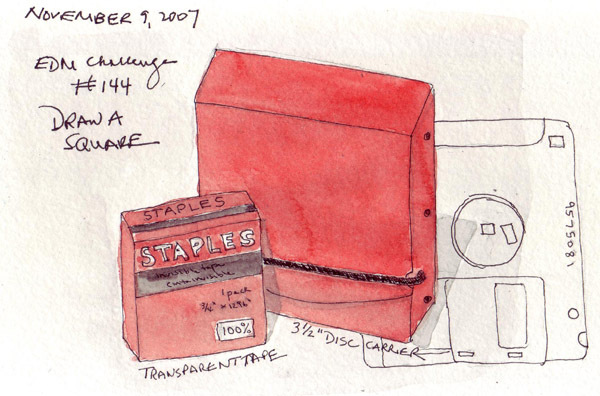 Then I found an old 3 1/2" computer disk and disk holder - near my stash of transparent tape which is in a square red package. In this age of CDs, DVDs, and flash drives, I haven't carried computer files on a diskette in more than 2 years, so I sketched the diskette as a ghost. I still take occasional ballet classes at Steps on the Upper Westside of Manhattan. Then I have coffee in the Barre Cafe at Steps until it is time to pick up my grandson at Nursery School . 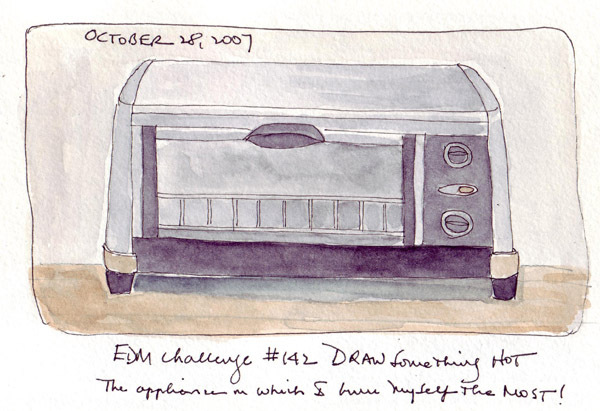 While there I sketch and paint dancers from magazine photos for my daily sketch and for more figure drawing practice. 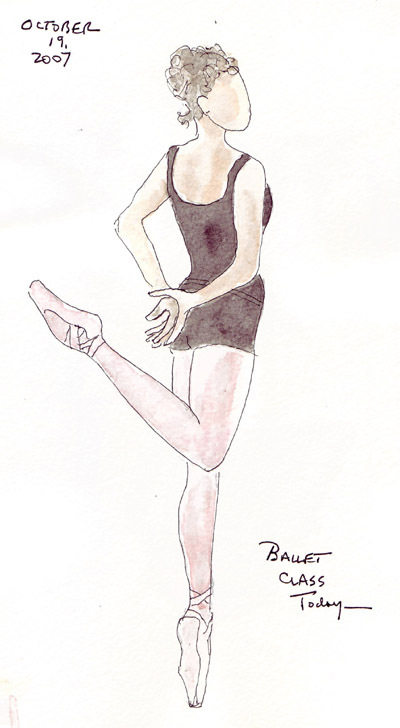 I could never sketch dancers in class and photography isn't permitted in the studios. 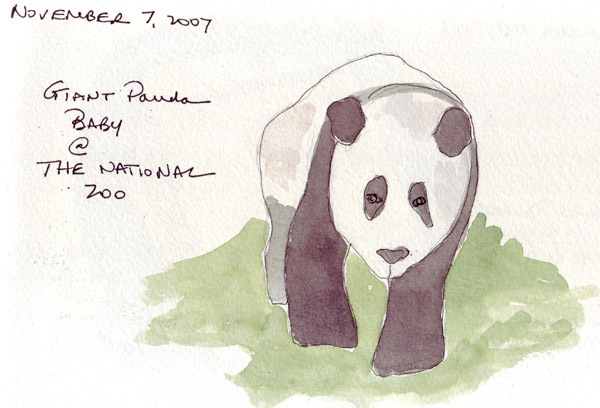 I had a few minutes on Tuesday after my meeting at the Marriott Wardman Park in Washington DC ended and walked up Connecticut Avenue to the National Zoo to see and sketch the Giant Pandas. 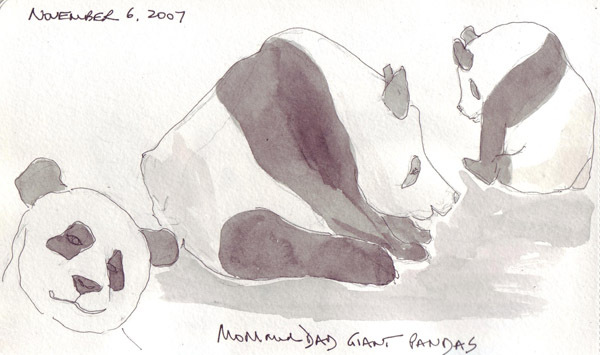 More than 20 years ago, I sat with my young daughter and sketched a Panda eating bamboo - and it didn't move for 20-30 minutes. The Panda Habitat has been recently renovated and there is a baby that was born in July 2007. I was able to see Mom, Dad, and Baby (who appears fully grown) and they were all in perpetual motion! Here are a few quick sketches that I did when they stopped for 30 seconds! There are 3 cameras in use at all times to track the pandas and volunteers (working in 3 hour shifts)move the cameras around continually to keep the Pandas in view on the screen. If you Google Panda cam you can see the 2 from the National Zoo and the 3rd that is sponsored at the zoo by Animal Planet. I still love watching them - and was thrilled to have the time to walk up to the Zoo. 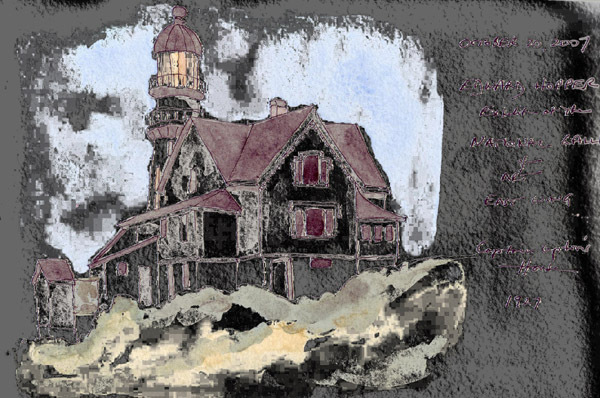 I was playing with Photoshop and my scan of the "Hopper" house painting I did one week ago at the National Gallery of Art - and suddenly this appeared! I have no idea what I did, but it looked alot like a Halloween haunted house. Happy Halloween to everyone. I'm off early tomorrow morning to International Quilt Festival in Houston and then a meeting in Washington DC, leaving my husband home to be with our grandchildren for Halloween "trick or treating." After one week away from my computer, I will have a full week of catch-up to do. When I looked for something "hot" all I had to do was look at the small burns on my fingers. I toast English muffins and bagels in a toaster oven daily - and as often as I remind myself that all parts of the appliance are HOT, I burn a finger or two! I love cinnamon, even mixed in with my vanilla ice cream. And I love anise - and the fascinating shape of star anise. 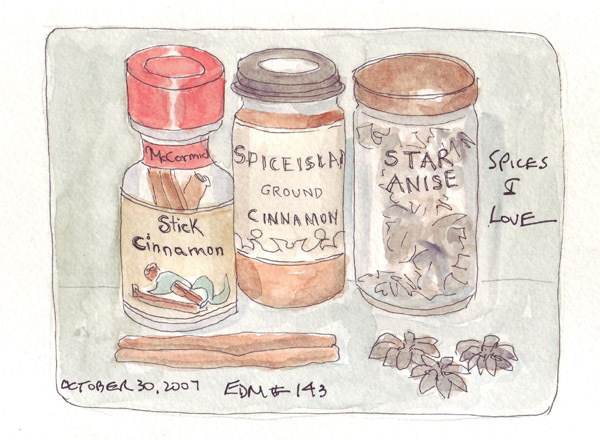 So it wasn't very difficult for me to quickly find spices for sketching.